Last year, Team Penske dominated the weekend at Road America, sweeping the top four spots in qualifying. But when the race was over, those four Penske cars finished second through fifth. 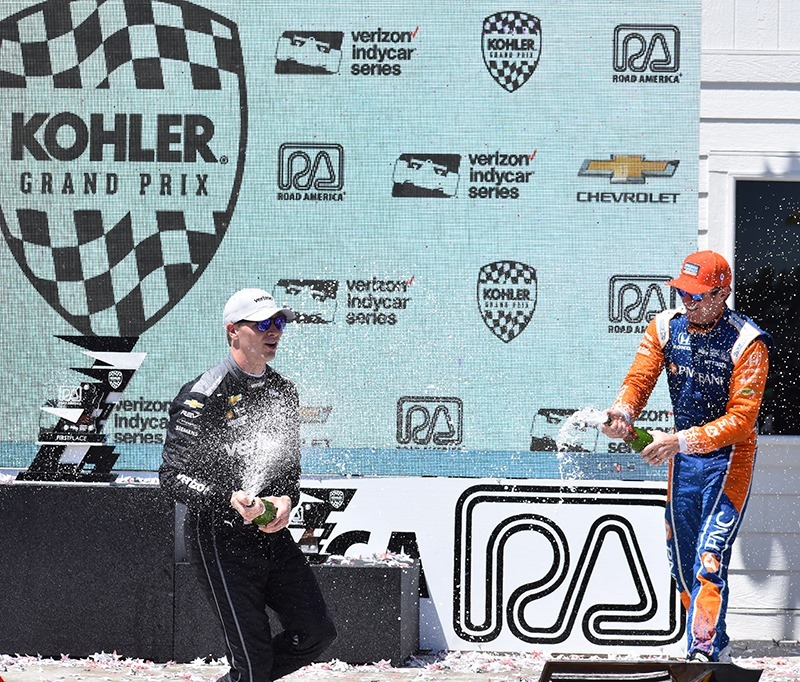 The stop spot of the podium was occupied by Chip Ganassi Racing’s Scott Dixon. There were no such miracles today, as Josef Newgarden won the pole and the race as Newgarden drove what was pretty much a flawless race. If you were looking for a race that had thirty passes for the lead, this was not the race for you. Newgarden led the entire way, only giving up the lead for two laps as the pit stops cycled through. 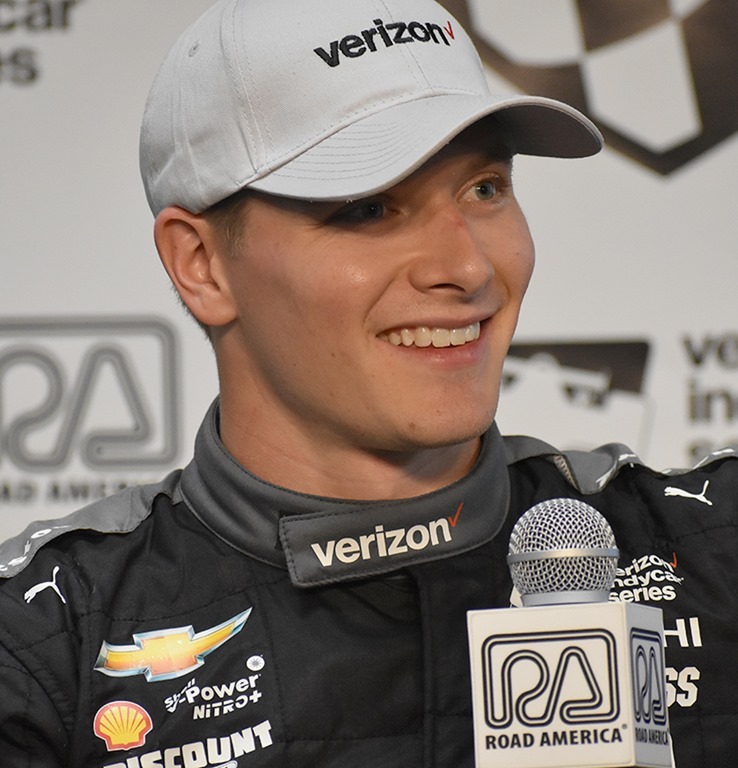 Newgarden led fifty-three of the fifty-five laps on his way to totally dominating today’s race. Ryan Hunter-Reay gave a valiant effort and stayed close to Newgarden, but it never looked like Hunter-Reay was a serious threat to catch and pass Newgarden. 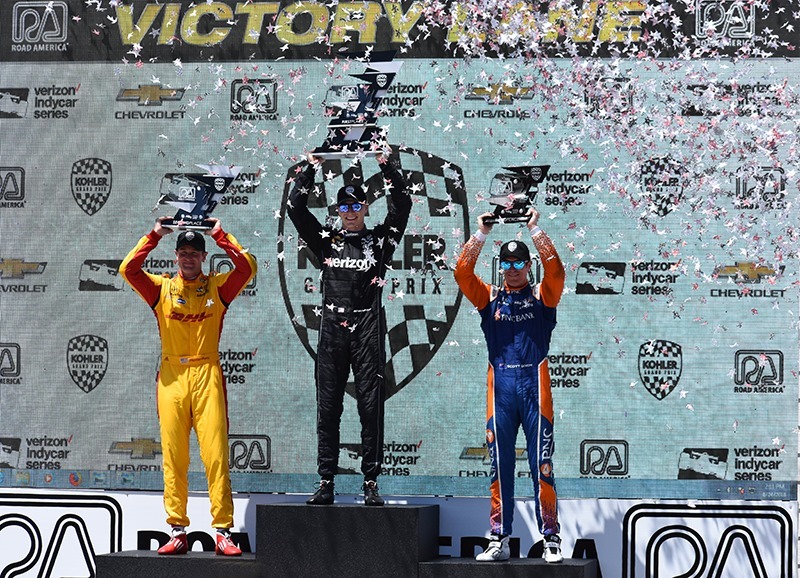 Scott Dixon finished third and extended his points lead. Going into the race, Dixon held a twenty-three point lead over Alexander Rossi. After Rossi had trouble on Lap 37, he pitted and came out in nineteenth place before finishing sixteenth. With Rossi having problems and Will Power going out on the second lap, the door opened up for Hunter-Reay to leapfrog them both and jump to tied with Rossi for second in the points, both forty-five points behind Dixon. Newgarden desperately needed this day. Not only did he get the win, but two of the four drivers ahead of him in points had issues. He now stands fifty points behind Dixon and trails Hunter-Reay and Rossi by only five points. It was about this point in the season last year, when Newgarden started mounting his charge for the championship. But he wasn’t chasing Scott Dixon last season. After a week off next weekend, the series heads to Iowa – one of the tracks that Newgarden has already figured out. He dominated the race in 2016 on his way to a win. He also has two second-place finishes at the 7/8th mile oval in Newton, Iowa. Scott Dixon, on the other hand, has not enjoyed much success at Iowa. In eleven tries, Dixon has never won and only has two third-place finishes. Iowa could really tighten up the points lead. But congratulations to Nashville’s own, Josef Newgarden. I’ve had the honor of being present at five of his nine victories. He is a fun winner. He has not gotten bored with winning and still seems to appreciate each one. It’s fun to watch him celebrate in Victory Lane and he gives witty and unrehearsed answers in the post-race press conferences. That’s going to do it for today. I will have a slightly abbreviated version of my “Random Thoughts” on Tuesday (not Monday) and Susan may have a follow-up post on Wednesday. For the third year in a row, Road America did not disappoint. 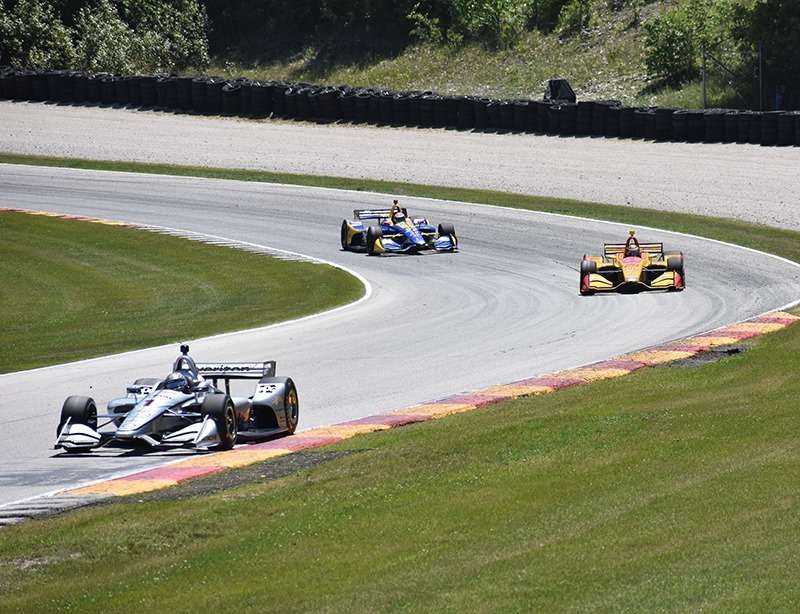 It was announced just before the race that Road America and IndyCar have agreed to a three-year extension. So if you have any desire to come to this race, start planning now. It’s well worth whatever trouble it takes to get here. Thanks to everyone who followed along this weekend. This entry was posted on June 24, 2018 at 3:49 pm and is filed under IndyCar. You can follow any responses to this entry through the RSS 2.0 feed. You can leave a response, or trackback from your own site. good stuff george and susan. thanks. Thanks George and Susan. I wish I could have been there. I went once a couple years ago and I was hooked. I’m glad that you enjoyed watching Hendersonville native Josef Newgarden winning again, after H.C. has gone sports car racing. I’ll read you on Tuesday. Thanks George and Susan for the articles and photos. This one is high on my list to attend, hopefully next year.